The IDTech MiniMag II is an intelligent, programmable MagStripe reader providing a wide range of functionality and value in a convenient package size. The entire unit is just 90 mm long, about the length of a credit card. It reads up to three tracks of information with a single swipe in either direction. It has a beeper and three-color LED indicator to signal a successful read. The reader is programmable so that the data format and intelligent interface output can be programmed & configured to match application and communication requirements. The Reader output format can be customized with user-friendly, Windows-based MagSwipe Configuration Utility. For example, after reading and validating card data, the unit can be programmed to parse the data, insert control characters, and add prefix/suffix characters while maintaining data integrity through vertical and longitudinal error checking. The reader also includes language options to ensure that the correct data is sent to the terminal. USB, Black, Keyboard Emulation, Reads tracks 1 & 2. Includes USB cable. Keyboard wedge, Black, Keyboard Emulation, Reads tracks 1 & 2. Includes PS/2 cable. USB, Black, Keyboard Emulation, Reads tracks 1 & 2. Includes USB cable. Cable exits from bottom of unit. USB, Black, Keyboard Emulation, Reads track 2 Only. Includes USB cable. RS-232, Black, Reads tracks 1 & 2. Includes RS-232 cable and power supply. USB, White, Keyboard Emulation, Reads tracks 1 & 2. Includes USB cable. USB, Black, HID, Reads tracks 1 & 2. Includes USB cable. USB, Black, HID, Reads tracks 1, 2, & 3. Includes USB cable. Cable exits from bottom of unit. RS-232, White, Reads tracks 1, 2, & 3, Port Powered. Includes RS-232 cable. Use these on Time and Attendance equipment in a shipyard where they get used hundreds and even over a thousand uses a day in some cases and these hold up better than the parts they replace. Extremely simple to use. Just plug it in and open up an excel spreadsheet. Swipe the card and see your results. Excellent for law enforcement use when identifying skimmed and or encoded credit/debit cards. 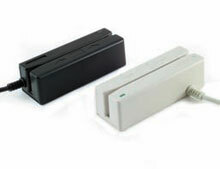 Use it as a credit card reader or program it for user access control. Works great allowing user access control where having passwords aren't feasible. Very easy to use, small and compact. We use this to scan our student ID cards, and it works great! we use this at a point of sale cash register. It worls fine. The last one lasted 8 years, time for a new one. Great item with a great price. The only issue is, since this does not have external power, if it gets unpluged by accident, you sometimes need to reboot the computer. We use the product to swipe student ID cards to check them into events for attendance requirements. The configuration tool was easy to use to pick up the specific location of the student ID number on our ID cards and had us up and running in no time. We contacted the manufacturer's support for assistance with an alteration to the formula and they were extremely helpful. Recently we rodered these for our dept and this is great. This will make things a lot easier when clients come in. All they have to do is scan their college ID and up pops their info! We love the small size, making it very easy to throw into the bag with the laptop and carry all over campus. It was very easy to set up and customize it to our particular system. This is card reader is a solid performer in a number of my retail installations.